INTRODUCTION: Thousands of Ismailis around the world pledged a Nazrana (the term means an offering, a gift or a present) of Time and Knowledge (TKN) to their 49th Imam, Mawlana Shah Karim al-Hussaini, His Highness the Aga Khan, during the celebration of his Golden Jubilee from July 11, 2007 until December 13, 2008. 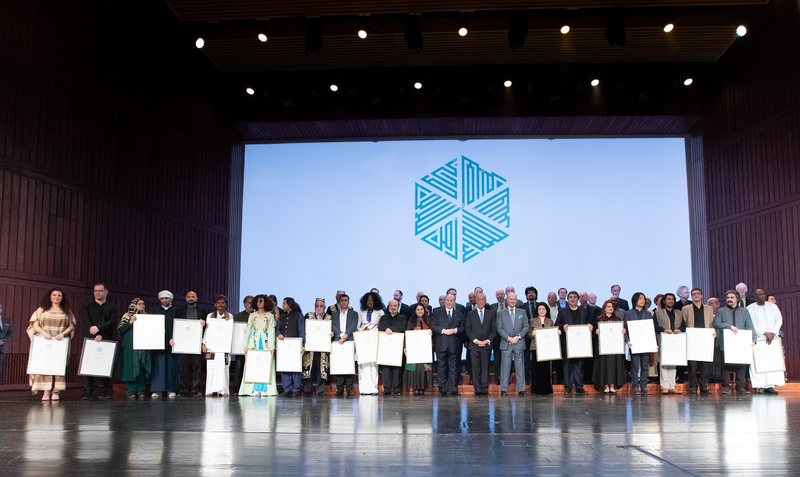 Numerous Ismaili individuals have since dedicated their time in the cause of institutional service and humanity at large in many endeavours around the world, without any remuneration. The story and photographs we are producing below is an example of hope and joy that one individual’s commitment to TKN has brought to people living in some of the remotest areas in the world. We hope that this will encourage other individuals to come forward and share their stories as part of Simerg’s 4th anniversary series dedicated to Ismaili volunteers, badged as well as non-badged. ‘Blind today seeing tomorrow’ – Dr. Kurwa working on one of his patients. He performed 98 surgeries on individuals blinded by cataracts. Photo: Badrudin Kurwa Collection. Copyright. One might wonder why a successful and busy eye surgeon, at the age of 60, would want to take the many risks associated with the project of restoring eye-sight in one of the remotest corners of the world. 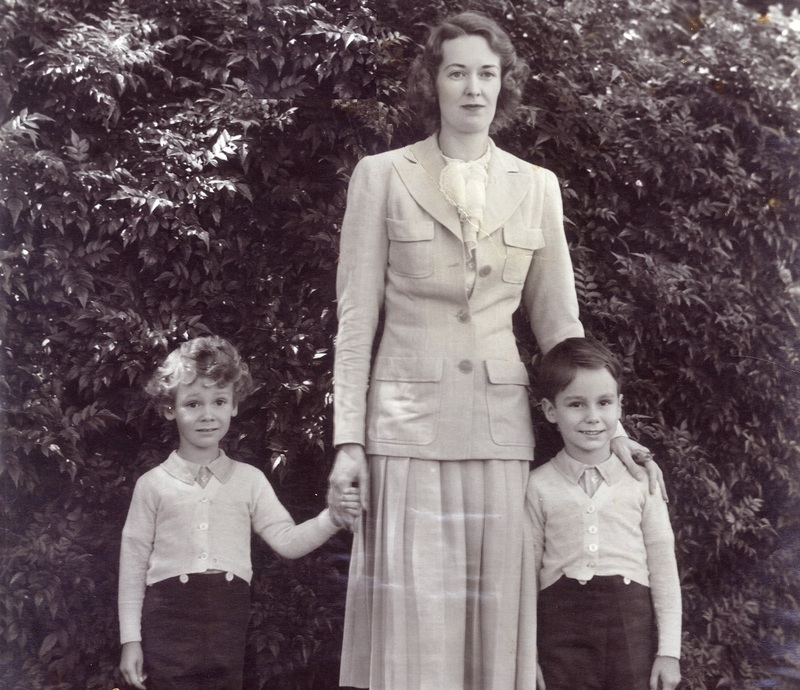 I was aware of the considerable risks and my family’s deep concerns about safety, security and health issues. We had heard about a recent incident in Nanga Parbat where nine mountain climbers were shot point-blank. Then there was the risk of getting sick from gastro intestinal disorders or malaria or worse. Also, the treacherous mountain driving meant accidents were a constant risk. A view of the Chitral River from the car. Photo: Badrudin Kurwa Collection. Copyright. Some years ago, I thought that I was in perfect health until I developed a small hernia. Upon the repeated prompting of my ‘doctor daughter’, I decided to finally get it fixed about two years ago. We were all set for the surgery when routine preop lab work showed severe anemia. I could not believe it. I was perfectly fit and active as ever with absolutely no symptoms. A repeat test at a different lab confirmed the anemia. At my age, unexplained anemia is a serious concern for colon cancer. So I went through numerous tests which revealed that I had several problems including gastritis, colon polyps, gluten allergy and squamous cell carcinoma. So I made a pact with my Mawla. “You save me, and I will give back to the community in whatever way you ask”. So there it was. Chemotherapy and Radiation for the following several months eradicated the cancer completely. The oncologist was amazed at the results, thankfully the cancer was caught at an early stage. Most of the time, the patient has no clue until it spreads everywhere and gets to an incurable stage. I guess Allah had plans for me unbeknownst to me. So this year, it was payback time. I got a call from the offices of TKN and the Aga Khan Health Board (AKHB) that they needed me for this incredible project, “New eyes for Old” or “Blind today…Seeing Tomorrow”. Mawla gave me 30 years to perfect my skills and now it was time to do my part. Badrudin Kurwa, at age 12, being awarded a prize by Mawlana Hazar Imam for standing first. Photo: Badrudin Kurwa Collection. This to me was the real Hajj, not simply going to Mecca – whatever skills Allah has given us the opportunity to become good at, we can use that gift and blessing from Allah to do what we can to help fellow human beings. The amazing thing I realized was that you can see many obstacles when you are considering a project like this, but if you have the courage and commitment to take on the challenge, Allah makes it happen. I thought to myself, “How will I alone make a difference? There are 2500 people blind from cataracts just in Chitral alone, and my intention to do 100 surgeries will be a drop in the bucket”. But He had bigger plans. Because of my willingness to go and the uniqueness of the project, the local Chitral health board did an amazing job of getting people’s attention, and pre-screened 850 people in all the outlying villages. I am told 450 of these came to have cataract surgery done after my departure with the local eye surgeon in Chitral City, because they were not able to see me but realized from my visit that sight could be restored. The general perception for all these years in that community has been that if you are old and blind that is just life, because it is the will of Allah and you live the best you can with what you have been given. Now, suddenly, they realized that it is a curable condition. I performed about a hundred surgeries but the impetus, what I might call a “Leveraged Social Entrepreneurship” inspired another 450 people to come forward for surgery to get their sight back. What a tremendous return for the effort put in. This was His will and doing. 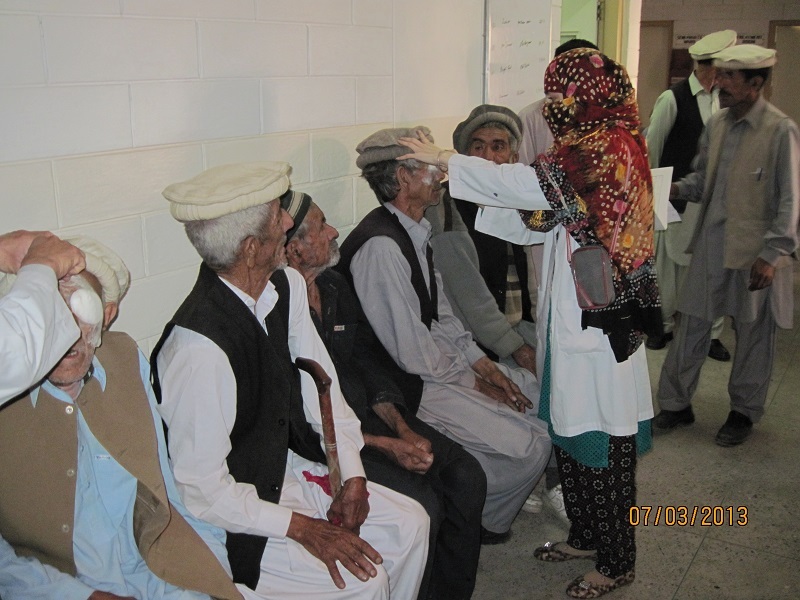 A large turn-out at the clinic when people heard about the surgery to remove cataracts so that they would see again. Photo: Badrudin Kurwa Collection. Copyright. It seems we have started a small revolution in getting people to realize and take action if their parents are blind. We almost had a riot, once the word got out that I was there; so many people came once they realized that treatment was possible. So this was the tip of the iceberg, now there is interest from Gilgit and Hunza to replicate these efforts and there is a tremendous need in Central Asia and Africa. So you see you just have to say “yes I will” and Allah is right there with you! Location of the district of Chitral (red) in Northern Pakistan. The town of Chitral with a population of around 20,000 is the capital of the Chitral district which comprises of a population of around 400,000 living in scattered villages across the Hindu-Kush range. Tirich Mir (7,708 m or 25,289 ft) is the world’s highest peak outside the Himalaya-Karakoram range and overlooks the town of Chitral. A large proportion of the population of Chitral belong to the Ismaili faith and are followers of His Highness the Aga Khan. The Chitral district has very poor infrastructure and access to healthcare, which is mostly provided by the Dept of Health supplemented by the Aga Khan Health Services. There is only 1 ophthalmologist serving the whole region, whereas USA has 1 per 20,000. There are 2500 people blind from cataracts. Map and caption credits: Wikipedia and Dr. Badrudin Kurwa. It was 1.30 am; I had just landed in Islamabad, Pakistan and gone through immigration when suddenly everything went pitch dark…the power went out in the entire airport and all operations ground to a halt. I waited in the dark for about 15 minutes and the lights came on (I had heard stories where it was common for the power to go out for hours on end). I walked out of the airport, thankful that the outage had only been for a few minutes. And there I saw a big bill board saying “Welcome to Islamabad”, and I thought to myself that for me the greatest adventure of my life was just starting. After flying straight for 26 hours from sunny Los Angeles here I was ready to get to Chitral for my TKN assignment – the first of its kind, an eye surgical camp in the ‘boonies’. Yes, my first assignment was to go to the Aga Khan Health Center in a small town actually called ‘Booni’. Tha Aga Khan Health Centre in Booni, Chitral. Photo: Badrudin Kurwa Collection. Copyright. The project was to restore sight to the people of Chitral blinded by cataracts. I was told there are about 2500 people blind from cataracts in this isolated region of Northern Pakistan and over 80% are Ismailis. These people were pretty much totally blind due to their cataracts, an easily cured condition in the West but without modern surgical techniques, these people were doomed to live a life of blindness. The general belief here was that one gets old and one goes blind, that is old age. You live your life the best you can. It is Allah’s wish and one should accept it. The idea of curing cataracts and getting sight back was unheard of. Most people did not know it could be done and then they did not have the money or access to surgical care. An elderly lady patiently awaits her turn for the surgery to remove cataracts. Photo: Badrudin Kurwa Collection. Copyright. AKHB-Pakistan and AKHB-USA recognized their plight and took a bold decision, and decided to do a pilot project to see if we could restore sight to the people of Chitral. So here I was headed towards the northern most region of Pakistan. A mountainous region with extremely poor people eking out a living on small pieces of farmland, cut off from the rest of the world many months in the year due to severe snow conditions and treacherous roads carved out of the side of the mountains and constantly in disrepair. The journey from Islamabad to Chitral City is a bone shaking twelve-hour drive on a road that is scarcely six inches wider than your car, and one has to watch out for oncoming traffic and hairpin ‘U’ turns that have no barriers or signs. We made it to Booni safely and I got busy getting the operating theater ready. I had two wonderful surgical technicians that made my work so much easier. They were amazing in their call to duty. One of the two wonderful technicians who assisted Dr. Kurwa is seen examining patients at the clinic. Photo: Badrudin Kurwa Collection. Copyright. Dr. Badrudin Kurwa with the amazing staff pictured in Shogore, Chitral. Photo: Badrudin Kurwa Collection. Copyright. The days flew by as we operated day after day from 8am to 10pm. What a great experience! Patients were blind one day, and could see the next day. You could see the joy and gratitude in their eyes as they looked around in amazement, and began to recognize their family members. It was touching to see them giving everyone loving hugs. They came forward and kissed our hands and prayed for us with all their hearts…there is no feeling as beautiful as that. The trip was so well worth it, and my hats off to the wonderful staff who made it possible. I performed 98 surgeries in two weeks. Dr. Kurwa with some of the lady patients. Photo: Badrudin Kurwa Collection. Copyright. Patients waiting to have the bandages removed. Photo: Badrudin Kurwa Collection. Copyright. A post op patient. Photo: Badrudin Kurwa Collection. Copyright. The parents of two girls, one aged ten and the other eighteen, came and pleaded that they were born cross-eyed and if they stayed like that no one would marry them! So I felt compelled to do eye surgery to straighten their eyes and they were so grateful. One man had only one eye and the eyelid was so droopy that he could not open his eye, so I fixed his eyelid up so he could open the eye and see again. Dr. Kurwa and his two technicians with a group of grateful patients. Photo: Badrudin Kurwa. Collection. Copyright. We visited a second city, Shogore, in lower Chitral where we were also greeted with a most wonderful response. So the plan now is to improve on our efforts for there is clearly a need not just in Chitral but also in adjoining Gilgit, Hunza, other Central Asia countries as well as African countries where there are significant Ismaili communities. Date posted: Wednesday, September 25, 2013. Dr Badrudin Kurwa MD, FACS, FRCS(C) was born in Mumbai, India, and moved to Karachi, Pakistan, with his family in 1958. 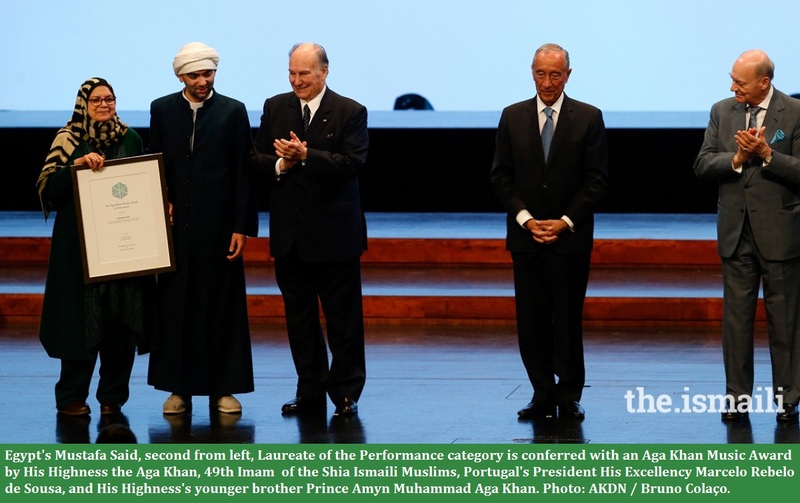 He was recognized as a very talented and bright student from a very early age, and at the age of 12 he was awarded the first prize for his academic excellence by His Highness the Aga Khan (see photo in article above). He became the first Ismaili as well as the youngest person to win the coveted Gold Medal from the Pakistan Association of Scientists and Scientific Professions (PASSP) in 1967. As a youth, Kurwa was also a keen musician and played for the Aga Khan orchestra. 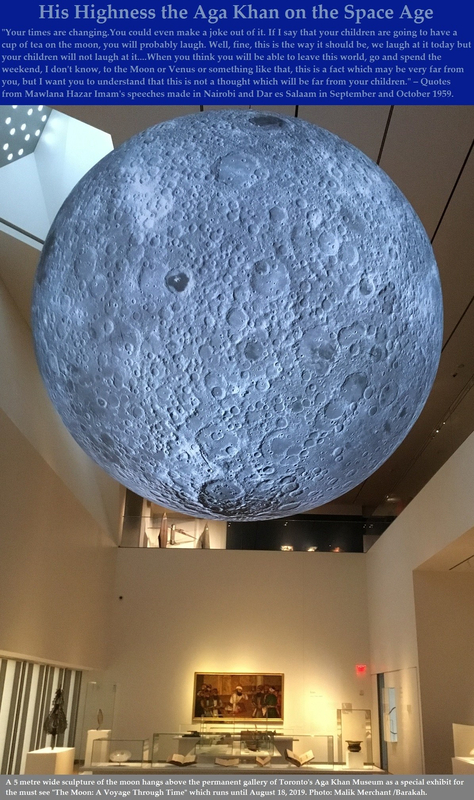 After completing his matriculation, he went to the United Kingdom and did his Pre-medical training in Oxford, and then attended the Medical School at Birmingham University, following which he proceeded to Chicago, USA, for his eye surgery training, He became involved as a volunteer within the Ismaili Muslim community, starting the 1st Ismaili Health Clinic in Chicago, and later helping to establish clinics in Houston and Los Angeles to serve members of the community lacking health insurance coverage. The Houston jamati clinic known as the Ibn-e-Sina clinic (named after the famous Muslim physician/scientist) continues to provide medical services even today after over 30 years, and is expanding to provide care to the local low-income community. In 1996, Dr Kurwa founded the Ismaili Health Professionals Association under the auspices of Aga Khan Health Board, USA, and was its first President. He also served with His Highness the Aga Khan National Council for the USA, and as a member organized Health Fairs in major US cities. On the professional side, Dr. Badrudin Kurwa holds four US patents and has been Clinical Assistant Professor at the University of Southern California, Doheny Eye Center, and at the University of Galveston, Texas. Simerg is looking for stories of Ismaili volunteers, as part of its fourth anniversary. To contribute, please read Stories of Ismaili Volunteers from Around the World. Incredible service to Maulana Hazar Imam! Congratulations! I salute you Dr. Kurwa! I was very happy to read Dr. Badrudin Kurwa’s story and am proud to have him as as my brother in faith for the wonderful work he has done. I thank him from the bottom of my heart. I live in Afghanistan’s Pamirs in the Badakhshan province – a little brother who has an immense amount of love for all my brothers and sisters around the world. I am very proud, delighted and I applaud your sincere efforts in this field! May Mowla bless you with his choicest blessings! Amen! A very interesting story, may Mawla accept this Nazrana. A truly dedicated Dr…Very impressed by his work! Ya Ali Madad, I went through this story with a matter of pride knowing that we have outstanding individuals in the jamat who have have given of their time and knowledge to the Imam of the time. This is humanity that Imam wants from us. I will share your story with many others. May you be rewarded a hundred times for your service. Stay blessed. Amin. Doctor Kurwa your story is very heartening and we ismailis are very proud of our fellow Ismaili involved in such a noble endeavour. May GOD bless you with lots of barakah and give you a long long happy and healthy life with peace and tranquility. What can I say Dr. Kurwa except that you were the instrument and Mawla was right by you. My prayers for your continued good health and strength to carry on your admirable service to less fortunate. You are fortunate, courageous and a great momin . Hazer Imam is indeed proud of Ismailis who serve and keep the flag flying. May we exceed our Imam’s expectations in all sevas that we can render. Hats off to you, our brother Dr. Kurwa for undertaking such a mammoth task after recovery from your illness. May Hazer Imam bless you and your family and inspire every Ismaili to perform similar selfless seva and fulfil our Imam’s dream. Dr. Kurwa ; You have done some amazing voluntary services to the humanity. Your account of experience of Northern Area of Pakistan is so so true. People of this mountain region are in isolation and without financial resources. If AKDN did not have its network and health care centers, one could imagine the state of conditions of these poor communities. Sir I salute you for your brave gesture and a remarkable manner you device of thanking Allah for giving you talent and knowledge to be able to correctly put in use your knowledge for people who are in desperate need it . This is the true sprite of Islam. May Allah bless you and your family for your courage step. Congratulations….Wonderful work done by Dr. Kurwa, we really appriciate your services and efforts for Jamat. Dr. Kurwa, you are a true Muslim in every sense of the word. Having worked in Chitral and Northern Areas of Pakistan for years I know the challenges the people are facing, including in the health sector. Your contributions will go a long way in encouraging others who are more fortunate to ignite the spark of hope in this community. Congratulations and all the best when you proceed to Hunza, Gilgit, Baltistan and other parts of Northern Areas next time around. I will be happy to assist you in your logistics through my contacts should you need it. I am one of the persons who accompanied Dr Badru from Islamabad to Booni Chitral. Your stay in Chitral was really appreciated and the people who are now able to see the world after surgery always pray for your good health, long life and Mushkil assan Ameen. Dr Badru you are not only a good surgeon but you are also a great leader, devoted and true Ismaili; My Mawla bless you and your family. We the community of Chitral are really proud for what Doctor Badrudin Kurwa has done during his visit to Chitral. We thank you so much. We have a special place in our hearts for wonderful work that you do. Real side of Islam. Thank you, Dr. Kurwa. You have made the whole Ismaili community proud. My chest has doubled in size today. I salute you. Doctor Badrudin Kurwa. You bring tears of joy to my eyes. Wow you make every Ismaili feel so proud. Congratulations to Mr. Bud Kurwa and his entire family. We are also thankful to Simerg for publishing these real stories to boost up the khidmatghars for pledging the gift of Time and Knowledge Nazrana to Imam of the Time & Jamat. I have known Dr. Kurwa for a long time as I lived in Los Angeles. I used to take Ismaili patients to him and lots of times he would do the needful free. Indeed he even restored my sister’s eye sight when she lost her one eye due to a mistake by forgetting and putting her finger which had chemical on it. The doctors in Pakistan told her the eyesight could not be restored, and she suffered for five years. When I came to know about it, I told her to come to Los Angels where I took her to Dr. Kurwa. He assured my sister he would do his best to restore the eyesight and he did, and she is still ever so grateful. The trip of Dr. kurwa to Chitral which he describes brings old memories when Hazar Imam sent us to survey the area for health, education, farming and the roads in 1976. I was assigned to go to Turkhov which is near Afghan border. The area is rugged – no jeep, no mule can go and you can only reach there by foot. I used to live with Ismaili families and did the survey. Dr. Kurwa had a short name of Dr. Bud Kurwa – all in his family are very good persons including his daughters. Sorry for a very long comment. Thanks. What a wonderful thing you have done restoring the sight of so many people. We are in awe with this wonderful accomplishment. We are so proud to call you uncle Kurwa! Thank you for your dedication and amazing work. You make us smile! I am from Vancouver and work in the Maliya Hatina district of Gujarat. While doing my Income enhancement and housing project, I saw there were 3/4 Ismaili blind in each of the 19 towns I was working in. We did a need analysis of the 19 towns as a pilot project and found out there were approx 220 who had eye sight problems. We ended up doing approx 80 cataract surgery using local doctors and hospital. We found during this exercise approx 29 cases with diabetics who were not aware of it. The rest of the cases needed corrective eye glasses. I could not do any thing for the people who had gone blind due to not getting their cataract surgery in time. This story about Dr. Badrudin. Kurwa tells me that those who are blind can be helped. Wonderful work by Dr. Badrudin Kurwa. I had no idea that Dr. Badrudin Kurwa had gone for his TKN in Chitral. Its wonderful to know that you got such a blessed seva and did wonderful work. Maashallah!! Congratulation Dr. Badruddin Kurwa for a wonderful job. You have set an example for our Ismailis and fulfilled the task of Time and Knowledge. This is what our Mowlana Hazar Imam wants from the Jamat. Keep it up and my good wishes are with you. Ya Ali Madad Aziz bhai, Thank you for your kind words. I do want to mention that I look at this kind of work as an opportunity that is given to you to give meaning to your life. One should grab this kind of opportunity whenever it is given to you. This is the only real meaning to life in my eyes. Congratulations Bud! You have always been a trail blazer and this will be the beginning of a much bigger programme. We pray for Mowla’s Blessings for you and the family. May you continue to shine in your TKN project and bring a lot of pride and blessings to the family. Our love to all at home. —That is a good initiative to highlight the Importance of TKN Nazrana. Congratulations to Dr. Kurwa and Simerg for sharing this great work of an exemplary personality of the Ismaili Community. Chitral needs such individuals in Education as well, especially in BROGHIL & ASHKOMAN. Beautiful story and wonderful work. I am glad that this story was shared. InshaAllah, it will give others an idea of how they can help. Just fantastic. Bravo for the wonderful work that you do. Glad that you had the opportunity and the courage to visit the hinterland and earn self satisfaction and the immense gratitude of whom you helped. You were always a caring and compassionate individual and not to forget your other half, Shamim bai, if I remember correctly from your time in Houston.